Mesut Özgen is a “highly accomplished and exciting player who gets the most out of the music he plays” (Classical Guitar magazine of England), as well as a composer whose works show the deep influence of traditional Turkish music. Critically acclaimed as “stunningly versatile and expressive” by Acoustic Guitar magazine, Mesut has been busy with concertizing, recording, composing, conducting, and teaching. Özgen joined the faculty of Florida International University in the fall of 2013 as director of guitar studies and the FIU Miami Guitar Orchestra. He has performed and taught master classes throughout the United States, Spain, and Turkey and was the director of guitar studies at the University of California, Santa Cruz from 1998-2013. In addition to being a prizewinner in both the International Portland Guitar Competition and the National Guitar Competition of Turkey, he has performed as featured soloist in many festivals, including the International Paco Peña Guitar Festival in Cordoba, Spain, Yale Guitar Extravaganza, Sierra Nevada Guitar Festival, Santa Cruz Baroque Festival, Healdsburg Guitar Festival, Istanbul CRR concert series, April in Santa Cruz: Contemporary Music Festival, Cabrillo College Distinguished Artists Series, Ankara METU Art Festival, Kars Art Festival, Konya Mevlana (Rumi) Cultural Center, and UCSC Arts & Lectures Series among many others. He was also founder, director, and conductor of the Santa Cruz Guitar Orchestra between 2010-2013. Currently, he is founder and artistic director of the Miami International GuitART Festival. Özgen’s first solo CD “Troubadour” feature classical guitar works inspired by Turkish, Spanish, Argentinean, and American folk traditions and was reviewed by the Guitar Review magazine as “a shining example of this guitarist’s great talent.” His award-winning multimedia concert DVD “New Dimensions in Classical Guitar” includes premiere performances of new guitar works with visual accompaniments comprising video, interactive computer images, and particularized lighting design. The Classical Guitar magazine said of this recording “the finest music DVD ever to have come my way, remarkable achievement.” His latest CD “Anatolian Fantasy” features entirely his own compositions for solo guitar, two guitars, soprano-guitar, flute-cello-guitar, and kemenche-cello-guitar. As a performer, Özgen has collaborated with many renowned musicians, such as Anthony Newman (harpsichord/piano/organ), Deepak Ram (bansuri), Benjamin Verdery (guitar), Cihat Aşkın (violin), Ihsan Özgen (kemençe/tanbur), Neva Özgen (kemençe), Shelley Phillips (oboe/French Horn), William Coulter (steel string guitar), Lars Johannesson (flute), Amy Brodo (cello), Patrice Maginnis (soprano), and Linda Burman-Hall (harpsichord). As a pedagogue, Özgen has published a book entitled “Designing Technical Training Programs for Classical Guitarists Based on Exercise Physiology Principles.” In this extensive research book, he combined information from various sub-disciplines of kinesiology, including functional anatomy, biomechanics, and exercise physiology, as they relate to guitar playing. Özgen’s compositions are mainly based on or influenced by traditional Turkish music. Among his other influences are Spanish composer Joaquin Rodrigo’s use of flamenco music and Turkish scholar/composer Yalçın Tura’s harmonization techniques. His unique style is comprised of dissonant harmonies – evoking microtones of traditional Turkish music, tonal folk-like melodies, and irregular rhythms. His most recent composition “Istanbul Express” for flute, piccolo, soprano, cello, and piano was commissioned and premiered by the Santa Cruz Chamber Players in March 2013. Özgen has also long been a strong advocate of new music for guitar and frequently collaborates with other composers. Composers who have written solo, concerto, and various ensemble music for Özgen include Anthony Gilbert, Pablo Victor Ortiz, Anthony Newman, Benjamin Verdery, Jack Vees, Deepak Ram, Christopher Pratorius, Robert Strizich, Charles Nichols, Paul Nauert, Yalçın Tura, David Evan Jones, Peter Elsea, David Cope, Erdem Helvacıoglu, Ken Walicki, and Phil Collins. Özgen’s degrees include Master of Music and Artist Diploma from Yale School of Music and Doctor of Musical Arts from Arizona State University, as well as an MD from Hacettepe University Medical School. He was the first guitarist to be awarded the “Dean’s Prize,” the highest honorary prize at the Yale School of Music, where he studied under the tutelage of renowned guitarist Benjamin Verdery. He began playing guitar in 1981 while pursuing his study at the School of Medicine. During his seven years of medical practice, as a self-taught guitarist, he also played concerts and taught guitar at the Gazi University School of Music Education and the Hacettepe University in his native Turkey. After his two performances in the International Paco Peña Guitar Festival in Cordoba, Spain in 1989 and 1990, he was invited to the U.S. by Benjamin Verdery to study with him at Yale University, School of Music. Özgen completed both his Master of Music degree and Artist Diploma at Yale. Later, Özgen studied with Professor Frank Koonce in the doctoral program at Arizona State University and worked as his teaching assistant between 1994-1998. His guitar studies also include many master classes with such distinguished musicians as Leo Brouwer, John Williams, Manuel Barrueco, and David Russell, as well as private studies with Jose Luis Rodrigo in the Real Conservatorio Superior de Música de Madrid. Additionally, he studied early music on guitar, lute, and Baroque guitar with Jaap Schroeder, Rosalyn Tureck, John Metz, and Robert Spencer. Özgen has also a long-standing interest in bringing classical guitar music to wider audiences. 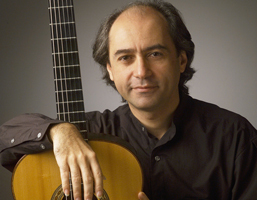 His staged performances include not only multimedia performances of the “New Dimensions in Classical guitar” concerts, but also “Folkie Classical Guitar” concerts with special stage design and costumes, presenting classical music based on various folk cultures, such as American, Spanish, Turkish, Greek, and Argentinean, as well as “Pick and Roll” for guitar ensemble by Ben Verdery, featuring a basketball player in dialogue with the ensemble and utilizing spatial elements in the hall.